Calling it a “historic transaction,” Berkshire Hathaway announced Tuesday it has acquired America’s largest private auto dealership group. The amount of the deal for the Van Tuyl Group was not disclosed in the news release. The company is called Berkshire Hathaway Automotive and be managed by CEO Jeffrey Rachor, who was Van Tuyl’s president. 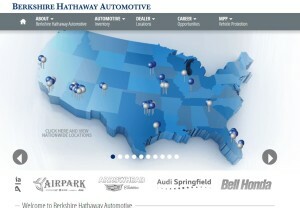 Van Tuyl’s website already redirects to the new Berkshire Hathaway Automotive site. The new company, which has 81 dealerships and 100 franchises in 10 states and does $9 billion in business, will be No. 5 among auto dealerships, Berkshire said. Forbes estimated in October when the deal was announced that Berkshire Hathaway would have to have paid at least $2.3 billion for the Van Tuyl family’s stake. “Mr. Buffett and I made this deal on a handshake and it is no surprise that completing the transaction went smoothly and according to plan,” Larry Van Tuyl, who will be chairman of the new company, said in a statement. “Berkshire Hathaway’s acquisition of the Van Tuyl Group has been embraced by all internal and external stakeholders. I want to take this opportunity to thank our manufacturer partners for their universal support and approval of the transfer of their franchises. Warren Buffett and Berkshire Hathaway are the perfect owners of this business. My father Cecil, the original founder of the Van Tuyl Group, would be very proud today. The Van Tuyl network gives local dealerships minority ownership in the company, and Berkshire will allow them to be equity partners. All have “enthusiastically committed” to stay with the new company, Berkshire said in its news release. Forbes reported that Rachor said the dealers’ minority stakes were not part of the deal, and its analysis of the deal used a conservative ballpark estimate of their combined equity at about 20 percent of the company. It’ll be interesting to see what the move means for the dealerships’ auto body shops and their local competitors. Berkshire Hathaway and Chairman Warren Buffett typically like to buy good companies and let them keep doing their thing, so there might not be a lot of corporate meddling for those of you employed in the shops. As for outside competition — both other collision repairers and insurers — having the nation’s No. 2 insurer in the same corporate holding bed as the nation’s No. 5 auto chain can’t be welcome. Similar issues were raised when Allstate bought Sterling Collision Centers in 2001 and was blocked in 2003 from expanding further in Texas. It sought to have the law overturned by the courts but was partially unsuccessful. The Supreme Court declined in 2008 to hear the case, letting the 5th Circuit decision stand, according to Insurance Journal. However, the court also agreed with the lower court decision that some restrictions on Allstate violated its First Amendment rights. The law had tried to block Allstate from recommending Sterling facilities over others in its direct repair program, restrict Sterling from using Allstate’s name in a way that other DRP shops couldn’t and prevent Allstate and Sterling from joint marketing. Possibly because of this resistance, Allstate sold off Sterling to Service King in 2014. That precedent might be one avenue for other states to pursue should they choose to do so, but based on the Texas case, it doesn’t sound as though you can “close the barn door after the horse has left” and stop Geico from certain partnerships with the existing Berkshire Hathaway Automotive network or force it to sell off the collision repair shops. Just what the federal government thought about two large, interconnected businesses being brought together under the same company was unclear. Federal law requires companies to notify the government and undergo a 15- to 30-day “waiting period” of government scrutiny if a merger or acquisition looks to meet certain thresholds under the Hart-Scott-Rodino Act. Many who notify the feds receive a shorter federal waiting review period with what is called an “early termination” given by the government. Asked about the Berkshire Hathaway-Van Tuyl deal’s federal review, the Federal Trade Commission referred Repairer Driven News to its “early termination” search page. No record of the deal could be found, though other deals by Berkshire and Van Tuyl are on there. However, this doesn’t mean that Berkshire didn’t secure the necessary approval; the only parts of the process that are public are the early terminations, any enforcement actions — there don’t appear to have been any — and possibly but not necessarily a letter from the commission.